Anyone who works with fast moving technology knows that there is always a new shiny tool that gets all the attention. It tends to change every few months and anytime you start to use a new tool, you do secretly wonder if it will be around all that long. By any measure, Twitter has passed these boundaries. It has been around for several years. Every day more and more people discover it and it's usefulness in their personal lives. New stories of the business potential of the tool are also coming out, such as Dell's recent report that they have made more than $1 million dollars through their DellOutlet Twitter account. Small business superstars like Gary Vaynerchuck (@garyvee) declare it the #1 most useful promotional tool in their arsenal. Clearly, Twitter isn't just the new shiny tool on the block anymore. Feel free to link to this image, grab it for use in your own presentations or blog (click to see a bigger version that you can download). UPDATE 2: Check out my follow up post, "9 Ways To Make Twitter More Useful For You." UPDATE: Thanks to those that pointed out I didn't share my Twitter name in this post. It's @rohitbhargava. I'm certain that for some Businesses it will work well. What I have trouble with is the constant evangelising that goes on. The Twitterati and the S'mores proclaiming that if everyone isn't on Twitter they are missing out. The above is simply untrue. Their must always be an element of common sense applied to any tool that is available for use. That bit is often missing. I find it also interesting that many of the Twitterati / S'mores actually aren't at stage 5. Some are still at stage 3. They want followers. Converse? forget it..
That impacts what people think of them (reputation management anyone) and their "personal brand", if indeed they have one. That is a great graphic. I was stuck at #2 for the longest time and then progressed to a #4 where I think I am now. Wanting to get up to a #5 superstar soon :) Thanks for this. This is spot on Rohit. #1 was my first reaction and came very naturally. It took a while to get over it and I would say I am between #3 & #4 right now but I can see acceptance is not too far away. I agree with Mike in that it's hard to believe that one tool can have high effectiveness for *everyone*. It really depends on the industry you're in, and what that industry uses. If I were a musician, I'd be all over MySpace, in contrast there are some industries that still rely heavily on forums for communication and promotion. Of course, the best way is to use a combination of tools to get the job done. Can't build a house with just a hammer, right? Stage 6: Addiction "I'll check twitter one more time before I go to bed"
1. What is the best way for a career strategy services company to utilize Twitter. Simply put what is the best strategy for tweets? 2. How do I maximize my search-ability on Twitter? One year ago I wrote a post that compared Twitter to a nosy neighbor who "always wanted to know what I was doing." Today, I embrace Twitter fully as the most functional research, marketing, resource, media relations, broadcasting tool in social media. Twitter was the means I used to contact BlogWorld Expo 2008 staff / Dave Cynkin and Rich Calvert. I volunteered my video recording services in exchange for an unlimited pass. It was there that I met you and recorded your excellent Sunday Keynote session with Mike Ferriss (the 4-hour Workweek), and Mike Shinoda of the Linkin Park band. The power of the "Tweet" on Twitter.com cannot be minimized. Now Sir Richard Branson is following me, and Chris Brogan is helping me understand the impact of Social Media on my various web properties for 2009. Thank you Rohit, for a timely and informative post. I am so very grateful for your keen insight, and willingness to give away so much of value. Love the 5 stages concept! (I was stuck on #1 for a long time until I dove in.) Now the advice I give to Twitter newbies is that, to get past #2, they need to follow a bunch of people to listen and begin to learn how they are using the tool. If they pick the right people, they'll soon be microblogging. It's great that you were able to see how Twitter wasn't working for your community and making headway in changing that to provide value to them while still growing your online presence. There's a lot of ways to use Twitter and certain feeds are setup strictly for promoting and it works because there is full disclosure to the community. For a personal account, such as yours, that is where it gets tricky and where you have thousands of eyes reading and analyzing your every tweet. Great points that helps shed some light on how we each are using Twitter. Rohit, you just nailed it with this post. What an accurate depiction... at least, it is accurate for me. I was just reflecting today that I finally "get" Twitter. At least, I'm enjoying Stage 4 very much! I just signed up for Twitter and I'm trying to figure out how to make it useful and to generate business. I have gotten clients/business through facebook and I've heard the stories of Dell and other companies/people who have gotten a lot of biz through Twitter so I'm hopeful. Rohit, Thank youfor the great graphic - a picture's worth a thousand words. I borrowed it for a post I wrote today on why people need to be on Twitter. Your visual aid can be helpful for people who opened a Twitter account and then didn't know what to do. If I hadn't have had a friend show me the shortcuts of using www.tweetdeck.com and expalaining te benefits she's gotten from Twitter I may never have gotten my Twitter mojo going. Great post! I think I ran from step 1 to step 5 within a week. I love communicating and have found the being authentic in all I say and do on Twitter has worked well for me in business. Your post is right on target! I think that I've just this week graduated from stage 3 to stage 4. I've finally started interacting directly with many of my "tweeps." Great post. I am at stage 3 and am looking forward to the leap to get to stage 5. I can conceptualize it, and I'm working to make the jump. Although I am not usually given to following links about Twitter in general, let alone about using Twitter as a business tool, I like to try and follow links tweeted by members of the Twitterhood, as I call my following and follower group, to get to know them better. This page made me see Twitter from a completely different viewpoint and I am grateful for that. To me Twitter has been the equivalent of a cocktail party and I have invited, and been invited by, people I meet there to join them at LinkedIn, Facebook, MySpace and so on, depending upon the nature of our interaction. It is fascinating to hear that some companies have succeeded in making useful income directly through their use of Twitter as I have generally considered it a totally unlikely place for corporate sales to be made. In fact, as soon as I leave this page, I plan to take a look at how Dell Outlet has conducted its Twitter presence. Thank you for a very interesting read, including the many comments your piece has attracted. Great post and nice breakdown of Twitter usage. I am in stage 3/4 myself. I recently looked at Twitter more seriously from a revenue generation stanpoint ( detailed here: http://www.savingtoinvest.com/2008/12/why-twitter-will-not-help-your-blog.html ). I am still unconvinced that Twitter can help with improving your revenue stream. Great job on the five stages. I am trying to move up the scale myself. Sometimes I find it hard to fit my thoughts into the 140 character limit, but I've found that discipline makes me a better writer. Your Twitter stages gave me a good laugh. A lot of people I know at first were in Twitter denial and are now addicted. I don't think I've hit the 5th/expert stage quite yet (I post about what I'm doing pretty often, which I think cancels some of the useful information out), but I'm working on it! 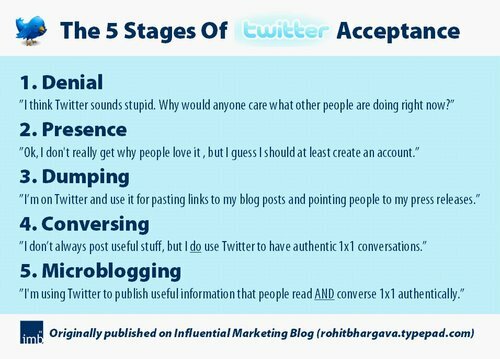 I love the way you break down the five stages of Twitter acceptance. We're just geting into twitter at my office, and your description is right on the mark. I'll be sending this url to my fellow agents. I really liked your graphic and I think it truly represents the stages that every Twitter user goes through. This is definitely a must-see for every Twitter skeptic. You nailed it with such an interesting visual aid. I even borrowed it for one of my blog posts. I have enjoyed twittering promotions, catching up with friends, seeing breaking news, learning from others, growing a community, leveraging my time by letting Twitter update the status of some of my other programs and a host of other things. My name is WendyMerritt and I am a Twitter addict. There I've said it! 2009 - Mass Market - ? Will it happen? I see some real problems ahead. 1. Twitter can be a time and productivity sponge. A day can disappear in a wirlwind of posts and replies. Even today I'm surprised that some users get any work done given how many tweetts they post! 2. Companies feel they are losing control of their messaging, brand and reputation. Employees are becoming their public face through blogs and microblogs. Will they let this continue? 3. Information overload. Can our minds process the information from thousands of followers? Will we reach information saturation and rebel against having this much data pushed at us 24 hours a day? 4. How useful is the information that most Tweets contain? I estimate that one in a hundred tweets I read are genuinely useful. Is this really an effective use of our time? Will Twitter be a genuine revolution or will it be the next Second Life? 2009 could be the defining year. It will be interesting to see. I'm still mired in #2. I'm struggling with figuring out how this Twitter is supposed to benefit me. One of the problems that I have is that I am in a rural area with only dial up access. Since my wife run's her business out the home (and she has a lot of calls to make) I can't be online all day or it ties up the phone line. I think that Social Media will be easier for me to use when I can finally get a high speed connection (I'm starting to seriously consider satellite since DSL, cable and wireless just seem to reach all around me. Thanks for the eye opening info. Great post. Thanks for offering up your 5-Stage graphic for others to use. Man, you nailed it. I'm at stage 4 and working on 5. I am at the conversing stage, and I see that I hit every single stage that you mentioned. I think that once I find a way to find unique and intriguing content, I'll be able to ascend to the microblogging stage. Very informative article but in my case I'm just wondering if in TWITTER, it's really natural clicks from people who are interested be your followers? Or it's the ADMIN who's just sending some accounts to be followers of other users? Twitter has definitely brought new subscribers to my blog. It has also given me awesome opportunities, such as guest blogging on popular sites, like Problogger.com. The really cool thing about Twitter, you can actually converse one-on-one with such icons as Darren Rowse, Chris Brogan, and Chris Garrett. I still haven't quite figured out how to pull it all together to fully benefit from the Twitter experience, but I'm working on it. Great post. Thanks for the input. spot on indeed; still in my twitter infancy (3 days and counting) and have managed to make it to dumping stage! have received a great twitter induction from pjnet http://padajo.wordpress.com and am really getting my head round it. I love it! I was so in denial for the longest time. I heard "twitter" hundreds of times before I ever even checked the site out. Now I'm microblogging full steam. I think im transitioning between stage 4 and 5. Good post Rohit. I agree with @cjguest - I can see immediate benefits for certain industries. I am still wondering about the cult of cyber celebrities though... whether stage 3 is in the eye of the beholder, one person's dump is another person's invitation to 4 & 5. Hi, great tips for Twitter users. At first I logged in to Twitter and signed up, there it was a blank sheet of paper and my first thought was OK what the hell do I do now then. It appeared to be like watching the proverbial paint drying! It was a little while before the deeper possibilities began to dawn on me and I wish I had found your tips a little earlier on. Would you consider a 6th? Extending. Maybe it is something like "I am using Twitter as an interaction as well as an introduction service via the link feature." If you consolidate your web presence on one page and stick that page in the link section on your twitter profile then twitter is great for extendring your networks. I built http://www.extendr.com for just this reason. We all only have one link in twitter. We all don't have the time to google everyone we meet on twitter. Why don't we all collect our own web presence one one page and share that page. It's about who knows you™ Help people know you. I just wanted to add one thing especially in regards to the common sense thought. It's all about a good mix. I never see anyone acknowledge the fact that you don't have to have a huge audience that follows you everywhere. You can "own" different audiences with different tools. Your friends on facebook. Business associates on linked in. Associates, friends, and business people on twitter. Clients on a blog, the masses on a TV show or vlog. There will NEVER be an all in one solution because that's not how people work, it never has been and regardless what tools are available I don't think people will change. Just my two cents. yah - i got it baaaad! Ha Ha Ha, love the stages! Stage 6: Evangelize and apply to client business challenges.